UW welcomes transfer students and works to make the transition easier than ever. Heading off to college may conjure visions of recent high school graduates packing their hand-me-down cars as tearful parents smile and wave goodbye. But nearly half the students in each University of Wyoming incoming class arrive as transfer students with some college already under their belts. UW welcomes transfer students from across the country and works to make the transition easier than ever. Recent collaborations with all seven Wyoming community colleges created two-plus-two program articulation agreements, which outline for students which courses to take during their two years at community college and which they will take during their two years at UW to complete their degrees in eight semesters. Below, you’ll meet three recent transfer students making the most of their time at UW. Claudia Vanessa Hernandez Marquez never thought she’d attend college. Now a senior, she serves as a role model for incoming freshmen and plans to pursue her master’s degree. But during middle school in Rock Springs, Wyo., she discovered GEAR UP, a U.S. Department of Education program that stands for Gaining Early Awareness and Readiness for Undergraduate Programs. During her time at WWCC, she saved the money and took the test to become a U.S. citizen, which qualified her for a federal GEAR UP scholarship. After earning her associate degree, Hernandez Marquez transferred to UW, and she will graduate in December 2017. She hopes to earn a master’s degree and then work in international social work, specifically in international adoptions. Hernandez Marquez also works as a GEAR UP mentor to incoming freshmen and is thankful for the role the program had in her life. “I love being that role model,” she says. She also appreciates the second family UW’s GEAR UP team—including Mel Owen and Jenny Ingram—provides. 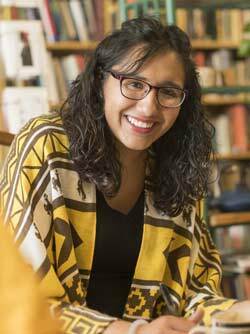 A successful transfer student, Andrea Sanchez Walk conducts undergraduate research and plans to attend medical school. Being hungry for days on end is a feeling one never forgets. That’s why Andrea Sanchez Walk, a full-time pre-med student at UW, makes it a priority to volunteer through her church and at the Laramie Soup Kitchen. There was a time when her parents didn’t have enough to eat, and she doesn’t want anyone else to have to endure that. Sanchez Walk emigrated from Peru with her parents at age 6. Learning English in elementary school in Rock Springs, Wyo., she soon became her parents’ interpreter and helped them start a cleaning business to make ends meet. Sanchez Walk always dreamed of going to college, but money was tight. “I didn’t think I was able to go to college because of the circumstances I was in,” she says. Still, she gave it a shot. Her freshman year at Western Wyoming Community College, she paid her own way by helping her parents with their cleaning business while getting her foot in the door doing undergraduate research. Professor Bud Chew’s team allowed Sanchez Walk to join its study looking at iron deficiency and how it affects heart function in rats. She soon proved her worth, and by her sophomore year, she was the student research leader. Chew also helped her secure student research funding through INBRE (IDeA Networks for Biomedical Research Excellence) to help pay her tuition as the team continued to study heart function in rats, this time looking at protein expression. the fall of 2015 as an INBRE Transition Fellow. “Now I study on sheep hearts, which are larger and more representative of a human heart,” Sanchez Walk says of her research with Assistant Professor Wei Guo. The team works on many projects, but she focuses on how an obesogenic diet (one that causes obesity) effects protein expression in the heart of pregnant sheep and their fetuses. Walk plans to attend medical school, possibly specializing in cardiology. At UW, she jumped into student life and is a member of the Institute for Healthcare Improvement, Alpha Epsilon Delta Health Preprofessional Honor Society and Women’s Leadership Program. She hopes to inspire more Latinos to attend college. 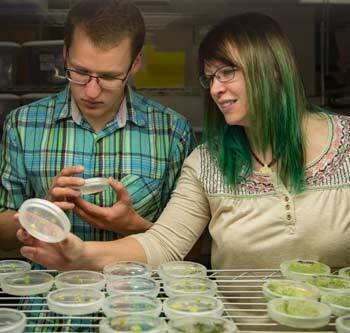 As a plant sciences teaching assistant, Kristina Kline works with student Eric Oleson in the plant biotechnology lab. A nontraditional student coming back to school after taking a number of years off, Kristina Kline planned on only earning her associate degree from Sheridan College. “Then I realized it would be easy to get my four-year degree, and it was going to be worth it in the long run,” says Kline, who grew up in Gillette, Wyo. Kline is taking advantage of a pilot 3+1 program that allows horticulture and agroecology students who complete their associate degrees at Sheridan College to then do a year online and a final year at UW to compete their bachelor’s degrees. Kline heard about the program through UW Assistant Professor Sadanand Dhekney at the Sheridan Research and Extension Center, where she conducted undergraduate research. Last summer, Kline completed a research internship with Dhekney at a grape vineyard near Sheridan College. “Since the summer, I’ve been working more in the biotechnology lab, where we’re looking at salt tolerance and inserting genes into the grapes to make them more tolerant to salt and drought stress,” she says.